Even if a colony survives the winter, that doesn’t yet mean that it’s out of the woods. The aged population of “winter bees” is now faced with the formidable task of rearing a complete replacement population of new workers during often unfavorable spring weather. Allow me first to revisit late winter broodrearing, since it set the stage for the spring turnover. I’m typing this article shortly after grading our thousand colonies (some of them three times during their development) for almond pollination. The colonies went into winter in relatively poor condition, due to the combination of severe drought and a relatively high varroa level. 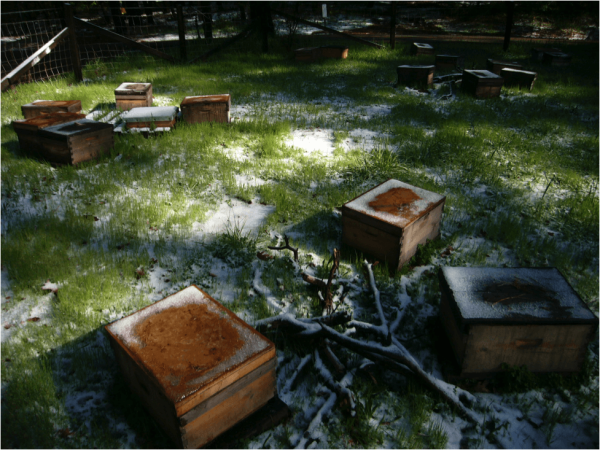 We were able to get varroa under control, and by supplemental feeding we got the hives to start brooding up in October, but that was abruptly set back by a cold spell in November. Spring arrived in my area about 2-3 weeks early, with the first alder pollen becoming available in mid December, at which point the colonies started seriously growing, with us eagerly cheering them on, since we weren’t sure whether many of them were going to make grade. And this brings me to the importance of the late winter broodrearing that Lloyd Harris found to be so important to the resultant colony condition in the early spring. The honeybee’s striking habits of starting brood rearing in midwinter and swarming in late spring evidently help colonies achieve maximum use of the short summer season. Colonies whose onset of brood rearing was experimentally postponed until early spring showed greatly retarded colony growth and swarming… colonies with midwinter brood rearing had populations by 1 May more than 4 times those of colonies without mid-winter brood rearing. …brood rearing begins at a time when the daily maximum temperature averages only about 4°C [39°F], and intensifies dramatically while daily average temperatures are still only between about 5° and 15°C [41-59°F]. Achieving large colony size by late spring may also benefit colonies by enabling them to profit from the profuse blooming of spring flowers. In 1981 and 1982, the colonies on scales had achieved 61% and 41%, respectively, of their total summer’s weight gain by 1 June. It seems clear that the proper timing of colony growth and reproduction are critical elements in the honeybee’s suite of adaptations for life in cold temperate regions of the world. 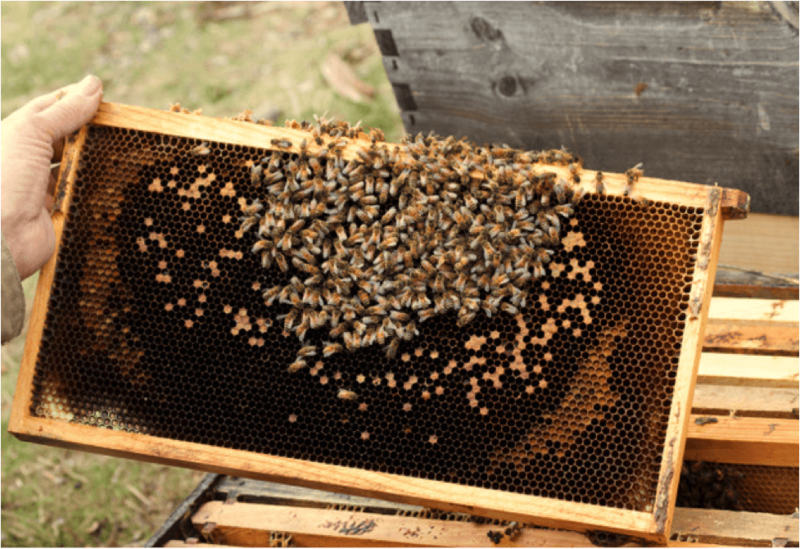 Practical application: in cold winter areas, depending upon how early your spring nectar flows are, or whether you plan to take hives to almond pollination, midwinter broodrearing may be critical for success. Such broodrearing is completely dependent upon there being adequate nutritious beebread in the combs to allow the nurse bees to produce enough jelly until the first tree pollens become available . In my area, our pollen-poor autumn does not provide such nutrition, so in order have colonies up to strength in time for almond pollination, I need to either place them on the better out-of-state fall pasture, or to supplementally feed with protein. Expand, clean, and warm the broodnest. This requires the aged bees to ramp up their metabolisms to increase heat production. The cleaning process also exposes them to nosema spores. A proportion of the aged workers must physiologically revert to nurse duty in order to produce jelly to feed the queen and larvae. This is a considerable nutritional stress and quickly uses up any protein reserves in their bodies. Other elderly workers must start foraging for pollen, often under adverse conditions. The availability of quality beebread or tree pollens, and the quality of the honey stores . The proportion of diseased bees. The problem faced by the colony is that the long-lived “winter bees” immediately transition to the short life expectancy of “summer bees” as soon as they initiate broodrearing and foraging in earnest . This means that the race is on for them to feed and incubate as much brood as possible at the same time that their numbers are rapidly dwindling due to attrition. This difficulty was well illustrated by Avitabile (Fig. 1). Figure 1. 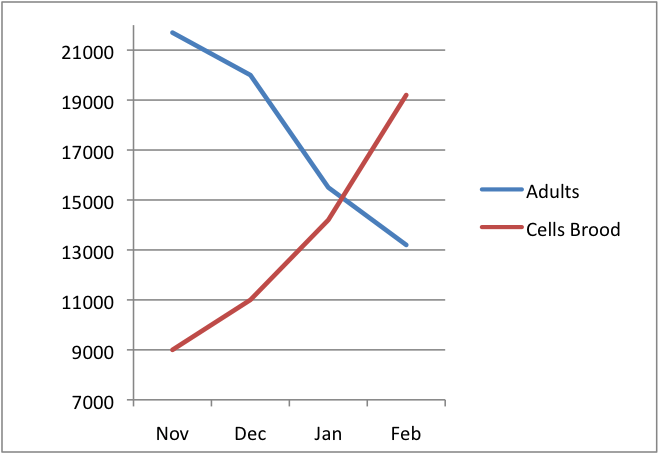 Number of adult bees versus number of cells containing brood in colonies in Connecticut during three winters (1971-74). Note that as the broodnest grows in size over winter, the number of bees available to keep it warm shrinks as the attrition of “winter bees” exceeds the recruitment of new workers. After Avitabile . All of my articles are works in progress, and I continually update them at my website. I generally send last minute revisions to the editor, and did so last month with the graph of colony age demographics, for which I had originally submitted a “smoothed” curve, but then decided that a more erratic curve which indicated the effect of two brief but intense nectar flows would be more instructive (Fig. 2). What I didn’t make clear is that the populations of the age classes, although based upon actual measurements of sealed brood, were calculated values based upon the survivorship curves of marked bees. So the jagged colony population plot is an estimate, although it is supported by a number of studies by various researchers . For our purposes, I will continue to use the version below. Figure 2. Although it may not be obvious to the eye, the population demographics of a colony completely changes during the spring turnover, from a colony composed mostly of aged “winter bees” to a rapidly-expanding population of youthful workers (note the figures for average age along the bottom). This has implications for colony nutritional requirements and the prevalence of various diseases. The spring turnover in cold climates may be the toughest challenge that an established colony faces during the year. In order to get a jump start on the season (especially in areas with early honey flows) the colony must build up its population well in advance of favorable weather and the spring bloom. At this critical juncture in the seasonal progression of a colony, I often see small colonies in late winter go “all in”—stretching themselves to the max in attempting to maintain as large a broodnest as possible, and hoping that they don’t get hit by a hard frost (Fig. 3). Figure 3. The broodnest in late January from a colony that I graded at 2-frame strength. Note that there are barely enough bees to cover the brood; I can hardly imagine how they kept it warm on chilly nights. But this early start allowed this tiny colony to later explode in population. The photo above was taken during one of our typical winter warm spells in the Sierra Foothills. Winter will return, and we often get snow falls clear into our main honeyflow which starts in mid May. The wild swings in temperature and available pollen and nectar are challenges to colonies of all sizes, but especially to those that have small clusters. The larger the cluster and the warmer the nights, the more brood it can cover, but smaller colonies gamble by raising more brood per bee (smaller colonies cover proportionally more brood relative to their populations). Amazingly, Harbo  found that a small colony may cover up to three cells of brood per adult worker. And note in Figure 2 that the number of cells of brood in May exceeded the number of adult workers. The metabolic and foraging stresses start to take a toll on bees that may have survived for 200 days; once they begin broodrearing and foraging in earnest, Harris found that the bees immediately revert back to the summer survivability curve, meaning that half will be dead within 36 days, and virtually all by 75 days . Unless the aged population that rode out the winter can manage to rear replacements before they die, the brood will get chilled, diseases can set in, and the colony can quickly spiral into collapse. In Fig. 2 the colony was not out of the woods until the middle of May, at which point there were enough new workers to take over. But there are a number of things than can screw up the turnover, and many colonies fail at this time of year (a number of them in almonds, despite abundant bloom and decent weather). Small colonies, since they tend to devote proportionally more of their efforts towards the rearing of brood, are able, conditions being favorable and with adequate nutrition, to grow at a proportionally greater rate than larger colonies, and may later catch up with them. I often see this with the dinks that I leave behind during almond pollination. In natural races of honey bees, those from cold winter climates (Carniolans, Caucasians, Russians) tend to winter with smaller clusters (presumably to conserve stores), and then build up explosively as soon as pollen becomes available. Practical application: for us California beekeepers, Italian-type bees are a natural choice. Many migratory beekeepers from other areas favor Italian type bees due to their propensity to overwinter with large clusters and build up early in the season for almond pollination. But for stationary beekeepers in cold climates, races of cold-adapted bees may take less management. The critical spring buildup and population turnover can be thwarted by any of several factors; let’s look at each in turn. The honey bee superorganism (the cluster) gathers into a spherical or ovate cluster in order to most efficiently maintain its critical thermoregulation of the broodnest. In cold weather, the bees at the periphery of the cluster turn head in and pack tightly together, invisibly “shivering” to keep warm , and using the directional blood flow in their bodies to keep pumping heat back toward the center . As a result of the heat generation of the shell, the bees in the center do not need to generate much heat themselves, and can spread out comfortably and stay active. The temperature of the core appears to be regulated mainly by the “shell” of bees moving either in or outward. You can easily verify this by cracking open a colony in tight cluster, puffing some smoke gently onto the bees, and waiting a few seconds. The loose and active bees in the center will quickly move away from the smoke, leaving the cooler, relatively immobile bees in the shell forming a visible ring (Fig. 4). Figure 4. A winter cluster several seconds after a puff of smoke. Only the bees in the warm core were mobile and loose enough to move between the frames. The outer shell of bees is so tightly packed that it actually prevents air exchange , and acts as heater, heat pump, and insulation. Once the temperature inside the hive walls reaches about 57°F, the cluster no longer forms the tight shell. But even during summer at higher latitudes and elevations, nighttime temperatures may be low enough to require its formation. Although highly efficient in conserving energy, the cluster still loses heat via conduction, convection, and radiation. I was curious as to how much heat was lost via conduction through the honey. I found that surprisingly little conduction takes place (Fig. 5). Figure 5. On a cold morning I inserted calibrated temperature probes right at the edge of the insulating shell of bees in order to determine just how sharp the temperature gradient was in the honey right at the top edge of the cluster. As you can see, there was 8°F difference over an inch, demonstrating the low rate of conduction of heat via the honey. I apologize for the out of focus photo. More heat is apparently lost via convection or radiation from the surface of the cluster. 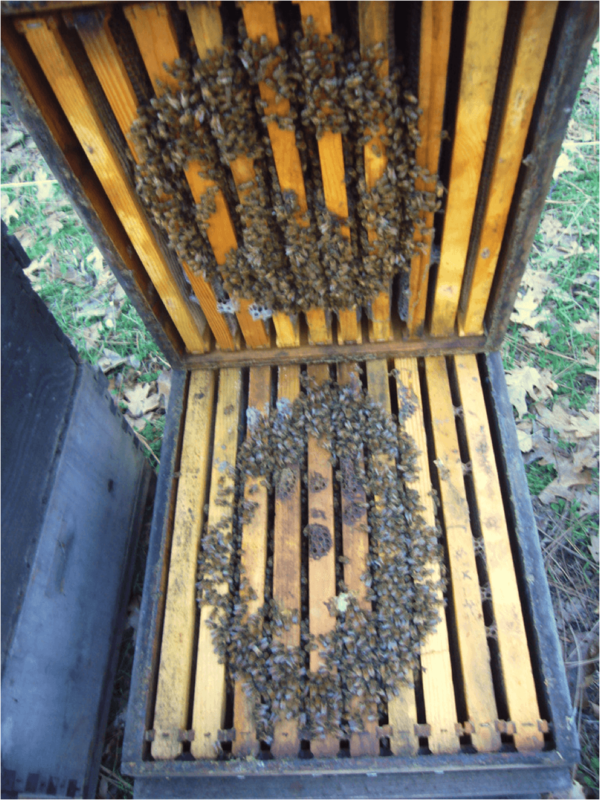 The vapor of the metabolic water produced during heating escapes the top of the cluster and rises to the top of the hive , giving up its heat to the cover, the water vapor often condensing on the underside (Fig. 6). Figure 6. Colonies initiate broodrearing when daily highs start to get above freezing. These singles on an early spring morning after a snow clearly show how much heat is lost through an uninsulated hive cover during frosty nights. An added layer of insulation would allow the colonies to expand their clusters and rear more brood. What occurred to me when I was observing the buildup of the tiny colonies in the Negative Control group of my pollen sub trial last winter, was that they were simply too small to create much of a broodnest, due to their needing to devote a substantial proportion of their population towards forming the insulating shell. This limitation really held them back, allowing somewhat larger colonies to surge ahead and grow more quickly. Practical application: no matter how prolific the queen or how much pollen or beebread is available, the ability of tiny clusters to grow is severely limited by nighttime temperatures. Top insulation can be of great benefit. A larger cluster has proportionally less surface area than a small cluster and thus loses proportionally less heat. This allows it to devote more of its energy production towards broodrearing (Fig. 7). Figure 7. A. As the diameter of a cluster grows (blue line), the surface area grows as its square (red line), but its volume (number of bees) even more rapidly (as the cube). Thus, the larger the cluster, the easier for it to conserve heat. B. The limitation of the insulating shell. In small colonies, on cold nights, the contraction of the shell limits the maximum size of the broodnest (at this time of year, there would be no blue “free” bees). It occurred to me that if one were to inspect progressively smaller clusters of bees during cold weather, they would reach a point at which virtually every single work in the cluster was involved in forming the “shell” (the cluster would be all red). That would leave none available to maintain a broodnest until the weather warmed up. Practical application: it wouldn’t be until the weather warmed up that the cluster could expand enough to allow room for the queen to commence egglaying. And even then she’d still be throttled until the first rounds of emerging brood allowed for an increase in the population of the cluster, and thus an expansion of the cluster size. This is why it is critical for races of bees adapted to warm climates with early nectar flows (e.g., Italians) to maintain a larger winter cluster. And also why colonies intended for almond pollination need to go into the winter with a fairly large cluster (or be wintered in a subtropical area). Colonies headed by younger queens tend to prolong broodrearing into autumn, and produce more brood in spring . Avitable  found that “the total amount of brood in a colony headed by a young queen was almost twice as great as in a colony with an old queen.” Not surprisingly, colonies with larger populations in autumn tend to have larger populations in early spring  (up to a point ), meaning that they get a jump on buildup for the season. Practical application: Wives of course get better with age. Queen bees (in general) don’t. 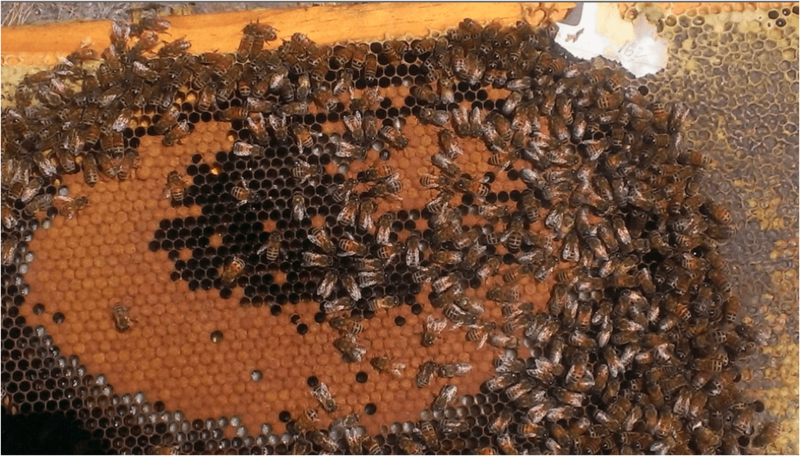 Keeping your colonies headed by young queens makes beekeeping easier and more productive. A colony cannot rear the necessary amount of brood on body reserves alone —it requires either ample stores of uncontaminated and nutritionally complete beebread or early tree pollens. Two meticulous studies by Mattila and Otis  showed how important a supply of pollen is for spring buildup . Practical application: It’s critical for the old “winter bees” to rear replacements for themselves prior to the spring bloom. In order to achieve this, colonies need either adequate beebread reserves from the previous autumn, a January pollen flow, or supplemental feeding with pollen sub . Frustratingly, colonies taken directly from cold areas to almonds may crash once bloom begins if they don’t have enough brood emerging to replace the loss of bees involved in the intense foraging. In hive epidemics of the various pathogens of honey bees tend to occur under certain conditions of temperature, the colony’s nutritional status, the average age of the workers, the prevalence of varroa, etc. The combination of poor nutrition, an aged population, and chilling of the brood that may occur in late winter or during spring turnover is favorable to certain viruses , nosema, chalkbrood, and EFB. Practical application: the various diseases suffered by bees each have their own season. Epidemics of any of the above pathogens, by causing morbidity or mortality of either brood or workers, can slow or even prevent a successful spring turnover. The beekeeper does well to understand which to be on the lookout for at each time of year, to (preferably) take preventative action, and to be ready to intervene if indicated. I’ve illustrated the seasonality of some diseases in Figs. 9 and 10. Figure 8. The seasonality of bee diseases over the course of two years, also showing how colony population tracks the availability of pollen (plotted in orange for my area). Notice that both colony population and seasonality of disease follow the availability of pollen, more so than temperature or month of year. Compare the above chart to the age structure of the worker population in Fig. 2. Imagine the differences in health and disease incidence between a group of 16-year-old humans and a group of 90-yr olds—it’s similar with bees. As the clock slowly ticks for the aging winter bees, infections of certain viruses, as well as nosema, can start to build and spread through the elderly population, especially if they suffer from chilling and poor nutrition. During breaks in the weather, sick and dying bees abandon the hive, committing “altruistic self removal,” leading to a slow evaporation of colony strength, balanced only by the trickle of recruitment from winter broodrearing. Fig. 9. USDA data for the prevalence of viruses. 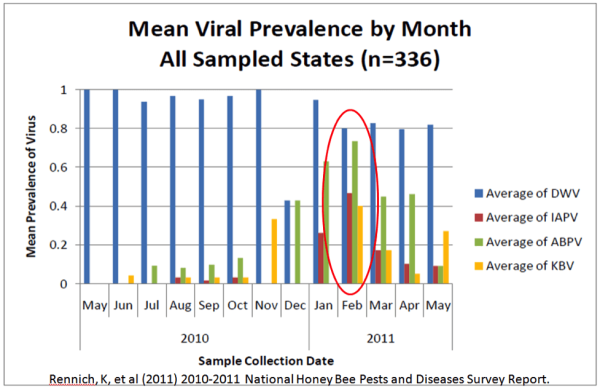 Note how DWV tends to follow varroa prevalence, but that the paralytic viruses are more prevalent during the spring turnover (immediately before and during almond bloom). Not shown is Lake Sinai virus, which can hammer my colonies . After the spring turnover, everything changes. Life is good during the late spring and summer, what with favorable temperatures and the associated abundance of nectar and pollen. Look at the figures for average age along the bottom of Fig. 2. Note the shift in May from a geriatric population of survivors to a surprisingly youthful population with rapid turnover. During late spring and summer, the bees simply outbreed the parasites and pathogens, and colonies generally enjoy good health. Practical application: be aware of which diseases to keep an eye out for at which time of year. Pathogens exhibit less effect upon colonies from mid spring through late summer due to the rapid turnover of the bee population. The brood diseases chalkbrood, EFB, and “IBDS” , by reducing the rate of recruitment, can bring colony buildup to a halt; nosema and viruses can do the same by shortening the longevity of adult bees. 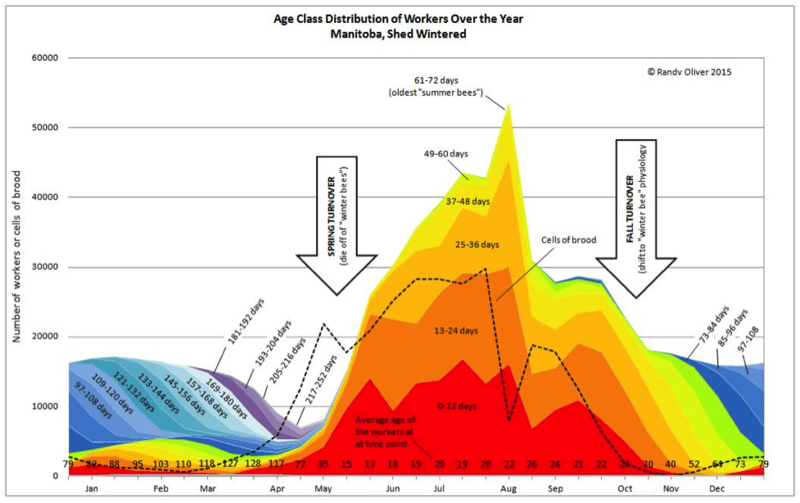 If the mortality of the older bees exceeds the recruitment rate of new workers, the colony then suffers from the condition often referred to as “spring dwindling,” or in the most extreme case, “CCD” (see my model of why this occurs at ). I should also note that exposure to pesticides, miticides, or pollutants may result in increased adult or larval mortality. Practical application: remember how by investing at compound interest when we were young resulted in us all retiring with fortunes? Well, it’s similar with colony buildup. it only takes a slight increase in brood mortality or decrease in adult longevity (due to disease or inadequate broodnest temperatures) to substantially reduce the rate of growth of a colony, resulting in a much reduced ultimate colony size by the start of the honey flow. Of special attention at this time of year is nosema, especially Nosema ceranae, whose invasion of the bee populations of Europe and North America (mainly between the years 2000-2010, but still continuing in some countries) appeared to be strongly associated with an increase in winter/spring mortality (see my related article in this issue). Mattila and Otis showed how nosema can extract a toll on a colony’s ability to perform the spring turnover—something that I’ve become acutely aware of in my operation since N. ceranae showed up . I often find that dinks which are unsuccessful at the spring turnover in February are seriously infected with nosema, and will fail if they are hit by a hard frost prior to their rearing enough recruits to expand the cluster (Fig. 11). Figure 10. A prime example of an unsuccessful spring turnover in the month of February. This unfortunate colony will soon perish. Note how it quite recently had a large broodnest, as evidenced by the ring of freshly-gathered pollen. But its population of adults was dwindling faster than new bees were emerging (attrition exceeded recruitment) and the cluster was unable to cover the sealed brood when we experienced a hard frost, leaving much of the brood to be chilled and killed (and then removed the next day). The bees remaining on this comb were infected with Nosema ceranae at the rate of 8 bees out of 10. Practical take home: beekeepers can really help their colonies by paying attention to the spring turnover. What I find is that a little TLC prior to this critical period of time (beginning in late summer) can greatly reduce colony losses, and result in greater honey production. One caveat is that if colonies build up too early and swarm, your honey production may suffer. So as with much of bee management, timing is everything. An understanding the processes going on within the hive can help one to make better management decisions. I will continue in the next installment with the linear growth of colonies prior to the honey flow. I could not have written this series without the help of Lloyd Harris and Peter Borst. We all owe a debt of gratitude to the several researchers of yore who went to the tedious trouble to tear apart hives and collect data to better our understanding of the honey bee. Severson, DW and JE Parry. A chronology of pollen collection by honeybees. J. Apic. Res 1981. 20:97–103. Some mineral-rich honeys, or honeydews that contain complex sugars may be worse for the bees than sugar syrup. Ditto for beebread made from poor-quality pollen, or that which contains pesticide residues. Avitabile, A. (1978) Brood rearing in honey bee colonies from late autumn to early spring. J. Apic. Res. 17(2):69-73. For example, McLellan, AR (1978) Growth and decline of honeybee colonies and inter-relationships of adult bees, brood, honey and pollen. Journal of Applied Ecology 15: 155-161. Harbo, JR (1986) Effect of population size on brood production, worker survival and honey gain in colonies of honeybees. J. Apic Res 25(1): 22-29. Hatjina recently documented that colonies in Europe commonly have 1½ times as many cells of brood as there are adult bees in spring, and sometimes in summer (and that some races of bees can stretch to 2 cells of brood per adult bee). Not unexpectedly, colonies tended to cover proportionately more brood in warmer latitudes than they did further north. Oddly, only half the tracked colonies (in six diverse European locations) grew to over 10 frames in size the first summer (although they hadn’t been treated for varroa). Hatjina, F, et al (2014) Population dynamics of European honey bee genotypes under different environmental conditions. Journal of Apicultural Research 53(2): 233-247 Open access. One doesn’t actually see the shivering, since they do it by isometrically contracting their wing muscles. What you can observe is the pumping of their abdomens to breathe. The bee heart pumps haemolymph from the abdomen through the thoracic muscles to the head, so heat is constantly moved back into the cluster. Water vapor is less dense than air, especially when warmer than the ambient air. Free, JB and PA Racey (1968) The effect of the size of honeybee colonies on the food consumption, brood rearing and the longevity of the bees during winter. Ent. Exp. & Appl. 11: 241-249. Otis, GW, et al Mattila (2004) Storage proteins in winter honey bees. Apiacata 38:352-357. Mattila, HR & GW Otis (2006) Influence of pollen diet in spring on development of honey bee (Hymenoptera: apidae) colonies. J. Econ. Entomol. 99: 604-613. Mattila, HR & GW Otis (2006) Effects of pollen availability and nosema infection during the spring on division of labor and survival of worker honey bees (Hymenoptera: Apidae). Environ. Entomol. 35(3): 708-717. It is important to note in Mattila’s studies that the large amount of pollen in her “pollen limited” colonies would make a California beekeeper drool. The beneficial effect of supplemental feeding would be more pronounced in arid areas or when colonies are overstocked on pasture. Refer back what happened in my pollen sub trial when the alders began to bloom. Harris (2010) says it well: The rapid decline in the wintered colony’s population emphasized just how important it was in spring for colonies to rear as much brood as possible and as soon as possible or risk having colony numbers becoming severely depleted. For colonies to rear significant amounts of brood, however, they must have a source of natural pollen or they must be fed pollen supplements or substitutes. DWV can easily go epidemic if there are many mites in the hive, but I see more problem at this time of year with the paralytic viruses (IAPV, KBV, ABPV, Lake Sinai Virus, and CBPV). Dr. Michelle Flenniken, in prep. vanEngelsdorp, D, et al (2013) Idiopathic brood disease syndrome and queen events as precursors of colony mortality in migratory beekeeping operations in the eastern United States. Preventive Veterinary Medicine 108(2–3): 225–233. Open access. Doublet, V, et al (2015) Within-host competition among the honey bees pathogens Nosema ceranae and Deformed wing virus is asymmetric and to the disadvantage of the virus. Journal of Invertebrate Pathology 124: 31–34.